Just one of thousands of lakes to explore in Washington. Where to begin? The lake above is where I ended my last book, A Sideways Look at Clouds. I was floating on my back contemplating the watery bodies that are the lake, the clouds, the human body. And this is where I am beginning my next writing project (hardly anything I can call a book at this point). The Washington landscape is a feast of lakes that are scenic, ecologically significant, life-sustaining, and a source of joy for a wild swimmer. “Wild swimming” the name for swimming in natural lakes, ponds, rivers, sounds, bays, and open ocean. It’s a big deal in England. There’s the Outdoor Swimming Society to prove it. Ever since I moved to Olympia in 2006, I have been swimming in lakes around the state. Though my pursuit of lakes to swim in has been casual, not purposeful, I’m up to about 30 lakes so far and am only just dipping my proverbial toe into the thousands of lakes our state has to offer. So where to begin my research? The usual places for this natural-history writer. In the library and in the field. Every writing project begins with a gentle plunder of my public library and mining of resources on my own bookshelves. And a map. The subject of lakes, lake ecology, limnology, lake swimming, and the pleasure of swimming and being in water is not new territory. The research is potentially endless and the physical territory where lakes are found is vast. The same was true with the clouds—only the clouds were more variable and ephemeral and required several (as in eight) years to capture in my book. A writer has to begin somewhere—to get to know the territory, to cast a wide net, to explore, brainstorm, dream. That’s where I am now. 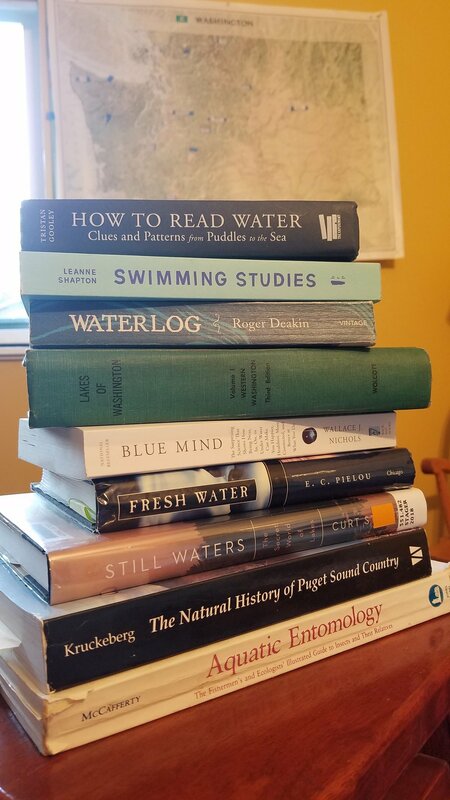 This winter, I have been reading, taking notes, gathering resources, signing up for newsletters and emails from organizations monitoring lake water quality, watching films about people swimming in really cold water, and marking this summer’s swims on a state map. In 2018, I began swimming in late April and continued into early October. The real “wild swimmers” who swim year round would rightly call me a “mild swimmer,” so I hope to develop the skills to extend the swimming season and increase my tolerance and enjoyment of very cold water. I am not sure how to accomplish this. Probably cold showers are a start. I hear they are invigorating. Maybe this should be the working title for my book! Brrrrr: A Wild Swimmer’s Plunge Into the Natural History of Lakes in Washington. A Sideways Look at Clouds has just been named a Nautilus Award Winner--a silver medal in the Science and Cosmology category. The Nautilus Awards represent "Better Books for a Better World." Of course the clouds make the world a better place (actually a livable place as a well as a gorgeous place) but I'm beyond thrilled to think my book on clouds could help make the world a better place, too. The core mission of the Nautilus Awards Program is to celebrate and honor books that "support conscious living & green values, high-level wellness, positive social change, and spiritual growth." How can a book about clouds do this? My book is a hybrid--natural-history, memoir, humor--and encourages every reader to look up and better appreciate the ubiquitous, life-giving, shape-shifting clouds in all their forms. Even the gray blankets that rain and rain and rain. Appreciating the beauty and function of clouds is just one part of my book. Understanding what a cloud is and does takes some grappling with physics, chemistry, and meteorology. What is a cloud? How does it float? What does it tell ups about atmospheric conditions and the weather ahead? What is the role of clouds in the changing global climate? Understanding what a cloud is also means some grappling with what you, the reader, want the clouds to mean. When I started writing my book, I wasn't interested in studying what kind of weather a certain type of cloud indicated. I was more interested in what would happen if I began looking up and wondering about something I had taken for granted all my life. Why did I know so little about them? Why don't we talk about them? What happened happened over eight years--the forging of a profound, abiding connection to the clouds while also embracing the ephemeral nature of the clouds--of life. The clouds were (and are) for me a source of joy, wonder, comfort, and even solace. As a global natural phenomenon that requires special equipment or access to observe, the generous clouds are there for everyone to explore. There's no cost, no side-effects, no expiration date. What you'll notice when you start looking up is that...things are looking up. This second "Sideways Plus" post offers an excerpt from "Cloud," the second chapter of my new book, A Sideways Look at Clouds, and illustrations and resources related to the chapter. "I recognized a cloud when I saw one of course, but I couldn't explain what made a cloud a cloud and not something else, such s smoke, haze, steam, or mist. I knew clouds were made of water and that they floated, but so did icebergs. What kind of water were clouds made of? Was it plain old water--H20--or something more special? Was fog a cloud? What were the defining features of a cloud?." "From twelve different sources, I copied out twelve different definitions of "cloud." I marked the words that appeared in at least three of the definitions. 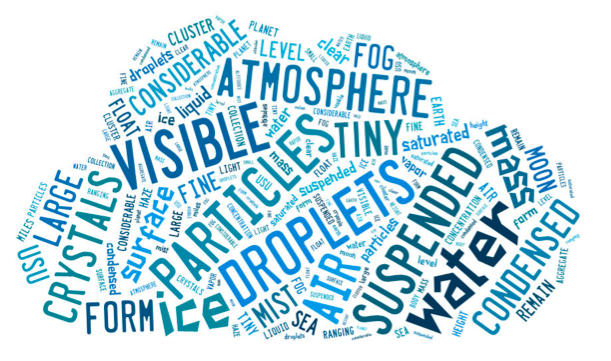 Ten key words emerged: visible, mass, water, droplets, ice, crystals, suspended, atmosphere, above, earth. By adding a few prepositions and articles, I created a new definition: 'A cloud is a visible mass of water droplets or ice crystals suspended in the atmosphere above the earth. '...Each word felt like a stepping-stone--no, more like a door. A door I could open. A door I could wanter through to find my way into the clouds." The Danger Zone: Click here for information on the free, two-hour SkyWarn Weather Spotter Training offered by National Weather Service (NWS) and the National Oceanic and Atmospheric Administration (NOAA). Local classroom training and online training are offered. Click here to hear the song that accompanied the time-lapse sequences of "menacing" clouds shown during my training course. The poor clouds! Luke Howard (1772-1864). This man brought order to the chaos of the skies when he introduced the Latin names for the clouds in 1802. Order a copy of The Invention of Clouds: How an Amateur Meteorologist Forged the Language of the Skies, by Richard Hamblyn. This story of Luke Howard (a chemist and lifelong cloud watcher) answers the question: Why did it take so long to name the clouds? Get lost in the clouds by following this link to the International Cloud Atlas. This new digital edition was released in March 2017 by the World Meteorological Organization and is the gold standard for professional meteorologists, for those working in aeronautical and maritime environments, and for the amateur cloud-watcher. The Cloud Appreciation Society is a web-based organization for cloud lovers around the world. On blue-sky days, you can find all the clouds (photos, poems, science, history) you'd ever want here. Become member and get a cloud a day in your inbox. Next Sideways Plus post will feature the "Visible" chapter. "Author Ruth (Rare Bird), who has penned nature books for adults and children, here turns her eyes to the sky in this delightful exposition on clouds. As a new resident of the Pacific Northwest, Ruth was surprised that her friends and neighbors didn't know much about the weather they experienced daily. Beginning with the word cloud, the author explores the mythology around the origin and meaning of the word. Ruth presents her own simplified definition based on numerous textbook characterizations. She then examines each aspect of that definition, from mass to visibility to water and air. Readers will learn about glories, lennies, caps, and sundogs as well as how clouds are seeded, formed on other planets, and created by human activity. Ruth describes the science behind cloud formation, movement, and identification clearly for general audiences; her personal experiences and asides enrich the well-explained technical details. VERDICT A great recommendation for popular science readers, this book will also appeal to those who enjoy memoirs and learning about the writing process.—Catherine Lantz, Univ. of Illinois at Chicago Lib."